European Parliament. Monetary dialogue with the president of the European Central Bank. 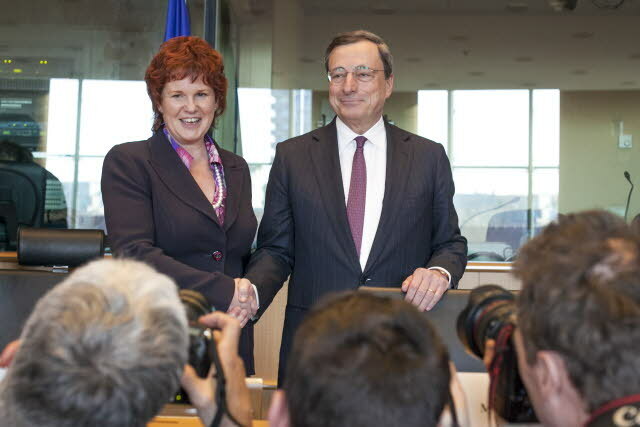 On the left Sharon Bowles (ALDE, UK) chair of the Economic and Monetary Affairs Committee and Mario Draghi President of ECB. (EP Audiovisual Services). Last Friday 8 November, the European Central Bank (ECB) published its opinion on the Single Resolution Mechanism (SRM) and Fund, fully supporting the European Commission’s position on their enactment, needed to accomplish the European Banking Union. The opinion is in direct contrast with the positions held by Germany, because it contains the following three essential requirements for effective bank resolutions: a single system, a single authority with decision-making powers and a single resolution fund financed ex ante by the banking sector. Understandably, the ECB believes that this is the only way to accomplish the banking union, after the central bank has definitely undertaken the task of supervising directly the 130 ‘systemic’ Eurozone banks and indirectly all the rest of euro area’s 6000 lenders. Supervision cannot function credibly and convincingly, without an effective resolution procedure being in place. It must be reminded that Berlin supports a decentralised version of SRM, scattered in the 18 national capitals of Eurozone. This position is aimed at keeping the small German savings banks out of the reach of the central Banking Union authorities. On top of that Berlin wants also that the German banks should avoid financing a single resolution fund, having second thoughts about paying for resolving of non-German lenders. There is more to it though. ECB’s legal service is also adamant that the “efforts undertaken to introduce the changes necessary to be able to use Article 114 (“approximation of national provisions”) of the Treaty on the Functioning of the European Union as a possible legal basis. This would make the establishment of the SRM possible without the need for a Treaty change”. At this point it must be reminded that Germany insists that in order to institutionalise a single resolution authority and fund, the EU Treaty has to be amended. Berlin maintains that such ground-breaking changes have to be based on a new Treaty. The obvious target of this position is to delay and water down the central character of the new institutions. This is a second blow to Germany in a row, after last Thursday’s decisive reduction of ECB’s interest rates. Jens Weidmann President of Deutsche Bundesbank and Jörg Asmussen member of the Executive Board of the ECB resisted strongly the reduction of central bank’s interest rates last week. It seems though that Mario Draghi took them by surprise and they proved unable to reverse the overwhelming majority of ECB’s Executive Board. There is no question that last Friday’s legal opinion as published by the central bank is quite clear. It states that “SRM should be established by the time the ECB assumes full supervisory responsibilities. (The) scope of SRM should include all credit institutions in EU Member States participating in the single supervisory mechanism. Institutions (banks) should become subject to resolution only after a supervisor (ECB or national central banks) has assessed them as “failing or likely to fail”. ECB supports having the bail-in tool (SRM) in place earlier than 2018. Changes to the proposed regulation have been made to ensure that Article 114 of the Treaty is a possible legal basis for establishing the SRM. ECB seeks representation in all plenary and executive meetings of the Single Resolution Board as an observer”. Nothing could be more clear-cut than this. In every respect ECB’s positions stand contrary to what Germany wants. ECB says that the resolution mechanism and fund should be institutionalised centrally and not locally (national), as Germany wants. All banks in EU member states centrally supervised by the ECB should be included in the SRM, contrary to what Berlin wishes. Last but not least, ECB’s legal service says that Article 114 of the EU Treaty provides a solid legal base for all that, in direct contrast with what the German Federal Minister of Finance, Wolfgang Schäuble has repeatedly supported. In view of that, Angela Merkel’s CDU and SPD’s German socialists agreed last week that no Eurozone bank resolution should be realised with taxpayers’ or ESM’s money. Presumably this will be one of the main points in their agreement, to form a grand coalition government in Berlin. However the swift creation of the SRM and Fund and their institutionalisation before the full capitalisation of the latter, doesn’t necessarily contradict this CDU-SPD agreement. The possibility of this Fund to borrow from the European Stability Mechanism or national sources and return the money after it is fully capitalised, doesn’t involve the use of taxpayers’ money, at least not in a definite way. This is a key point, if the SRM and Fund are to be operational together with the ECB’s official assumption of its supervision duties towards the end of 2014. The relevant passage of ECB’s Press release goes like that, “The ECB welcomes the EU Council’s call to adopt the legislation within the European Parliament’s current term. Furthermore, it strongly supports the envisaged timeline for the SRM to become effective as of 1 January 2015”. As Mario Draghi has stressed on many occasions, ECB’s bank supervision function needs to be accompanied by a strong SRM and Fund, in order to be credible and convincing. He also maintains that at a later stage, when the Resolution Fund will be adequately capitalised by the banking industry through a levy, it will return the money to its creditors (ESM, deposit guarantee schemes and governments). All in all, the ECB is decisively paving the way for the prompt creation of the European Banking Union, the most important EU institution after the introduction of the single currency. Obviously Germany has to reconsider its position now, because Draghi proved that the overwhelming majority of Eurozone member states do not support any more Berlin’s egotistic stance.